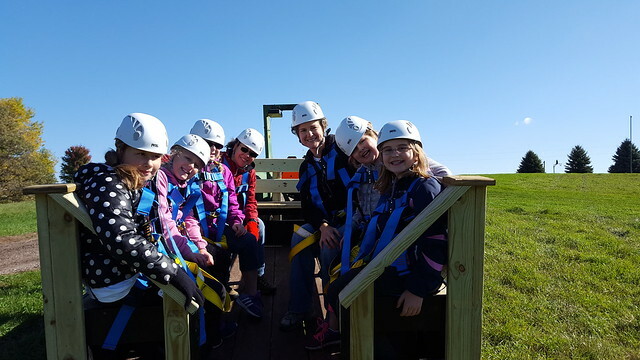 New at Camp Crossed Arrows is Nebraska’s first zip line tour! Open to the public, the five-station Soaring Hawk zips riders across prairies and through the woods. Zip lines are gaining in popularity in the United States after thrilling travelers for years in far-flung vacation spots – and Girl Scouts is excited to offer the new Soaring Hawk to our members and thrill-seekers from across the region! Not sure how it works? Riders are connected to a cable by a harness, which zips from one station to the next. Each run differs in height and length, providing riders a variety of thrills and views. Together, all the zip lines total about 1,950 feet. With walks in between zip line stations, total tour distance is about 3,590 feet. Riders should plan for 2 to 3 hours to complete the tour, depending on group size. Groups can include a maximum of 10 people. For safety reasons, riders must be at least 10 years old and weigh between 60 and 275 pounds. Camp Crossed Arrows is located 2 miles north of Nickerson, near Fremont. The address is 12997 County Road P1 Nickerson, NE 68044. Please enjoy a photo gallery from our 2017 Zip Line Tour Contest.